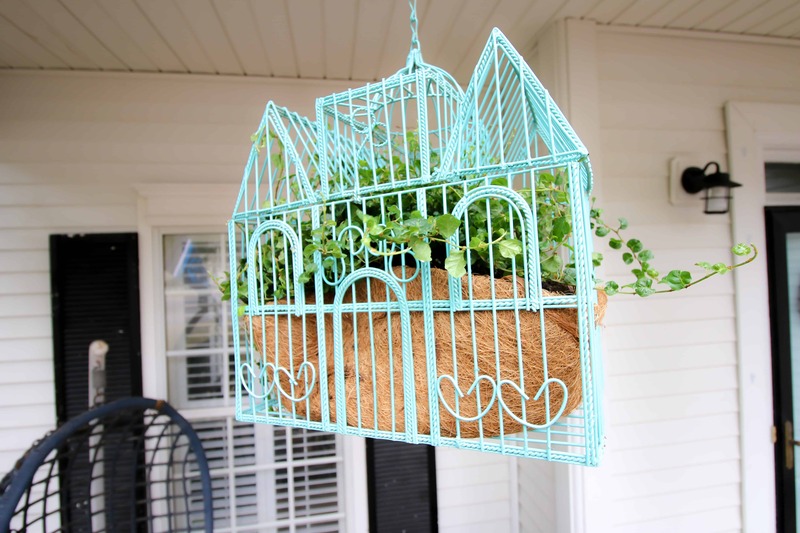 If you are looking to craft a DIY bird cage planter, check out my super simple tutorial! Recently we were walking our dog around the neighborhood and we passed a pile of “trash” on the side of the road. I, of course, had to stop and check out what was there. On the side of the pile were two bird cages. They were a little worse for the wear but I loved the general vibe. We decided to finish our walk (since we had just started) and grab the cages on the way home. Well, of course when we circled back, one of the bird cages was gone. I hope whoever got it is enjoying it! I still grabbed the bigger one and decided to give it a thrifty makeover. I am not normally a decorative bird cage kind of girl. My style isn’t rustic which I normally associate with these kinds of things. However, I loved the look of this metal bird cage. It was shaped to look like a house and just oh so charming! 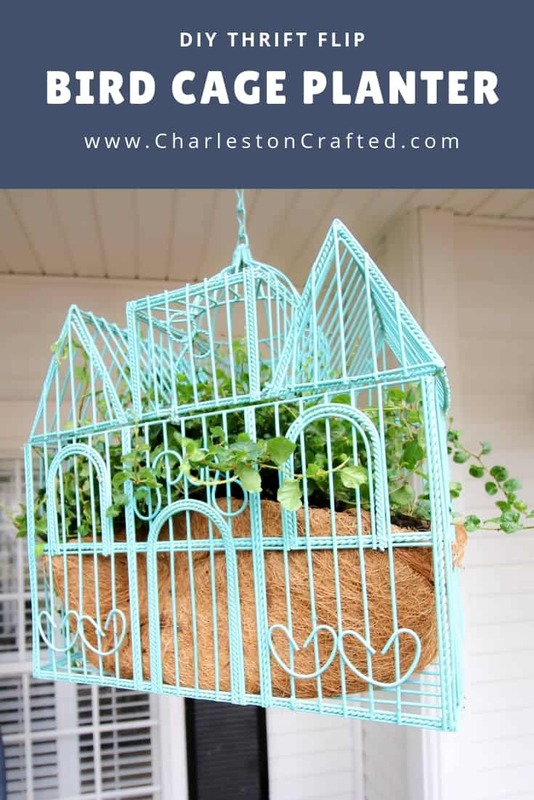 I cruised pinterest for ideas for what to do with a birdcage (since I don’t have a bird) and found a ton of bird cage decoration ideas. After browsing for a while, I decided to make it into a bird cage flower planter. It can hang on my front porch or sit on our plant stand. 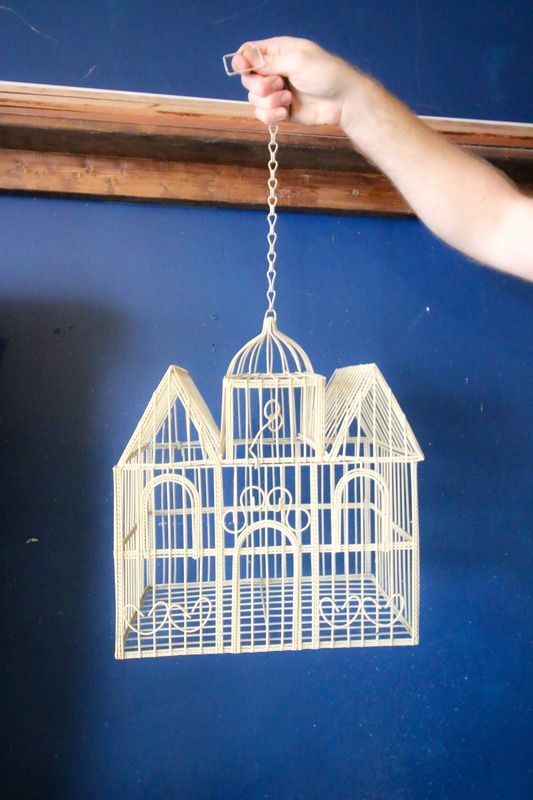 So, I am excited to share this bird cage upcycle with you today as a part of the monthly thrift store challenge! Any kind of plant – I went with a drippy ivy. Succulents would also be gorgeous! 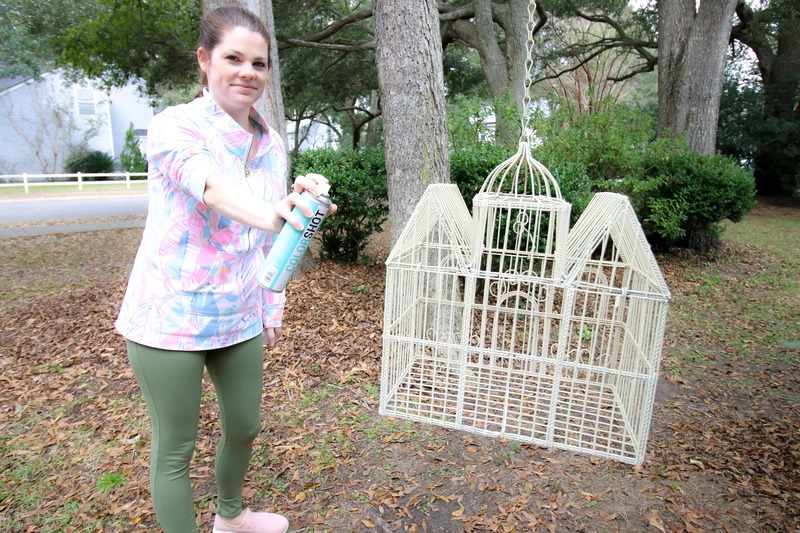 Clean your bird cage of any dust, debris, or loose paint. 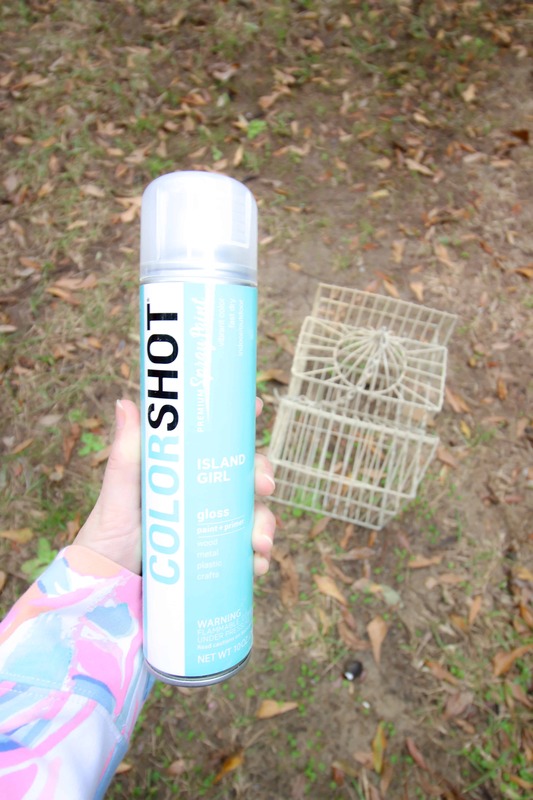 Spray paint the bird cage. Use several thin coats for best results and to avoid trips. Here are my spray painting tips! Once dry, insert your coconut liner. Trim with scissors if necessary. Add soil and your plant. If choosing a “drippy” plant, pull some of the stems through the wire bars for a cool effect! Hang or place in a sunny spot and enjoy! If you like this project, you might also like the time that we found a peacock chair on the side of the road or when I made a side table from a thrifted vase and chip and dip plate! I don’t normally like bird cages, but that one shaped like a house is so cute! Very pretty color too! It looks wonderful! I am totally kicking myself for getting rid of a decorative bird cage I had! I just didn’t have anywhere to put it but it would have been perfect for this. This turned out beautiful and I love this idea so much! What a wonderful idea. I love the color you painted the birdcage. It adds so much charm to your porch. I love roadside finds the best! And sometimes I take chances like you and return later to grab those treasures. I’m sorry you only managed to score the one but it turned out oh so lovely. Great upcycle, you guys! This is such a great makeover! I loved the color you painted it!